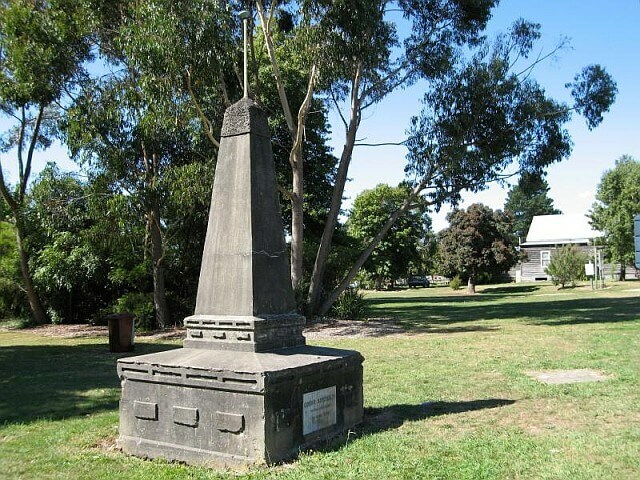 In the mid-1920s the Victorian Historical Memorials Committee decided to glorify Paul de Strzelecki with a chain of historical cairns for his the South Expedition expedition in 1840 by Gippsland. 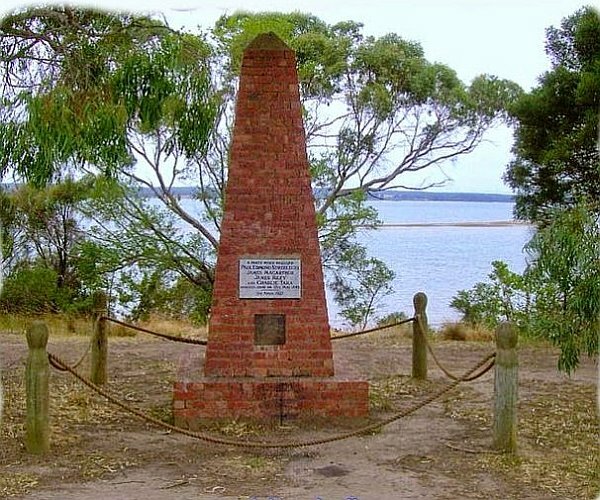 The Melbourne-based committee directed the design and placement of the cairns and asked local groups for organisational support. 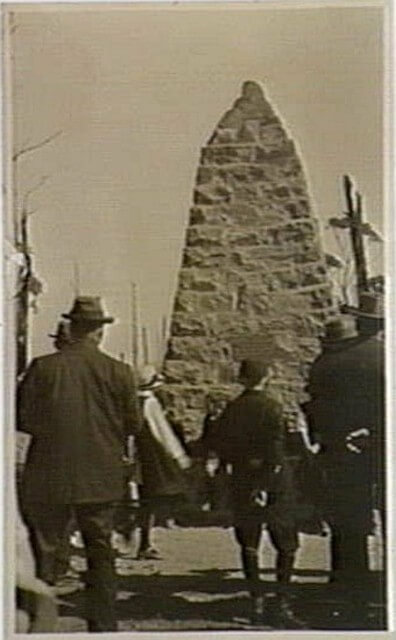 In April 1927, the committee and the Governor, Lord Somers, toured Gippsland to unveil the cairns. 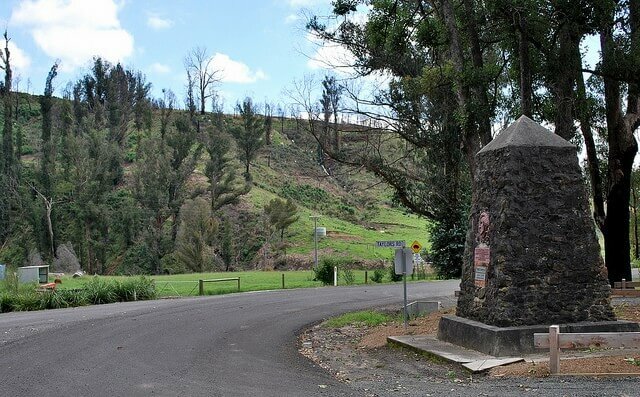 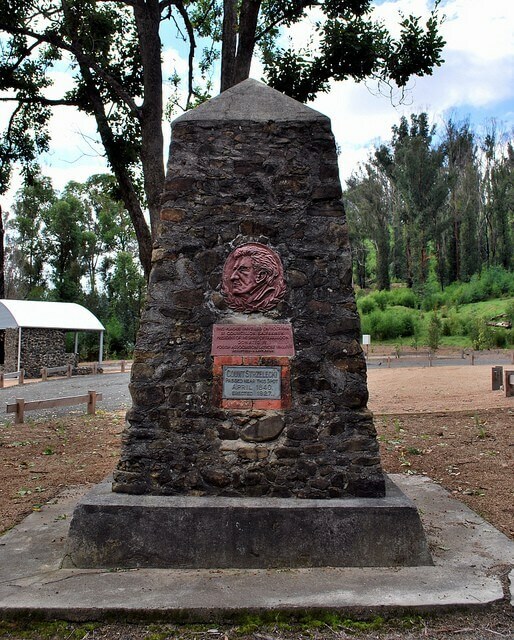 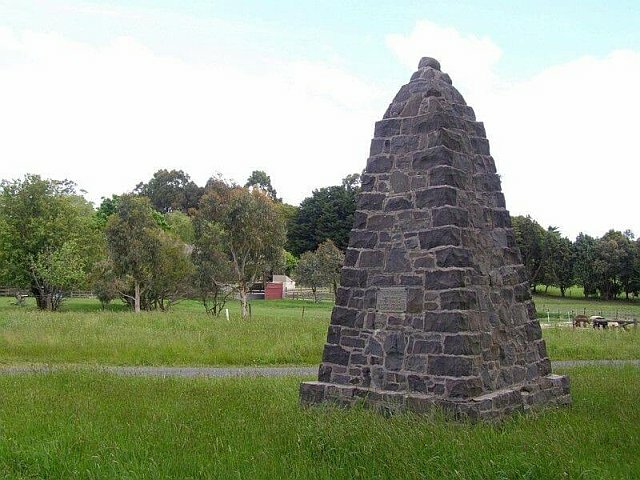 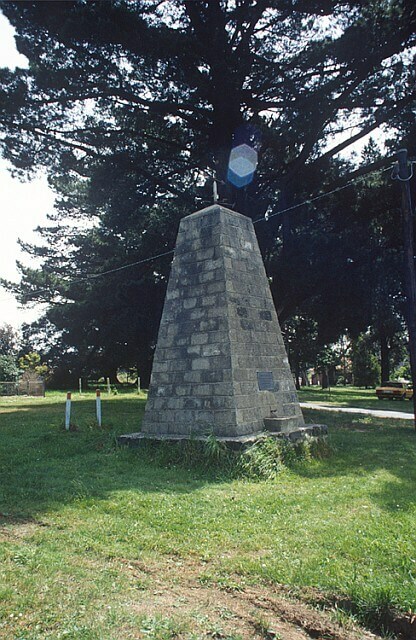 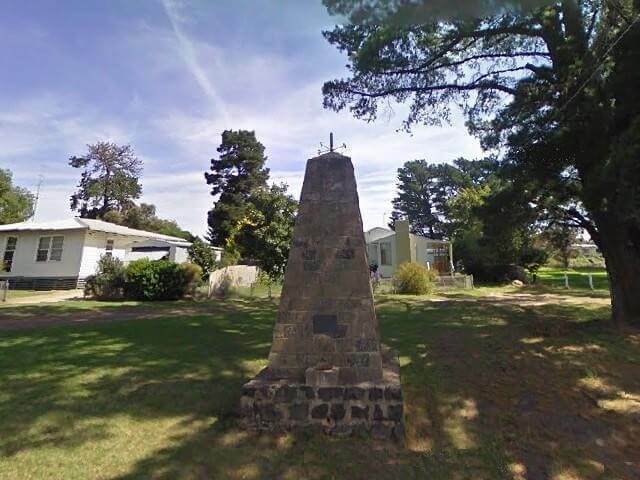 In order of occurrence reconstructed route of the expedition, erected seven cairns or tablets memorial are located in towns: Hayfield, Loy Yang (Traralgon), Koornalla, Mariboo North, Leongatha, Korumburra i Corinella. 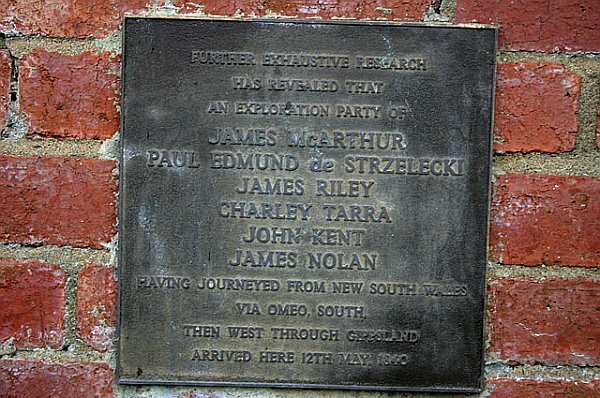 One plaque - unveiled in 1988 is also in East Maitland (NSW). 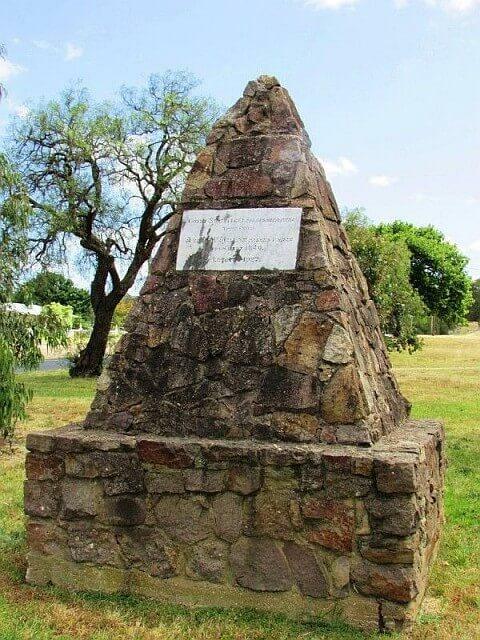 The first European contact in the area was made by both Paul Strzelecki and Angus McMillan in 1840 when they crossed the Thomson River near present Heyfield. 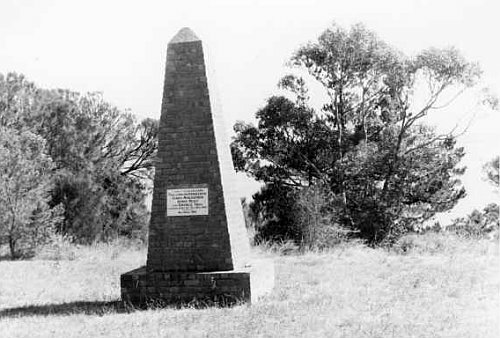 The memorial cairn erected to the memory of McMillan and Strzlecki was unveiled this by Lord Somers, in the presence of one of the largest dithering ever seen in Heyfield. 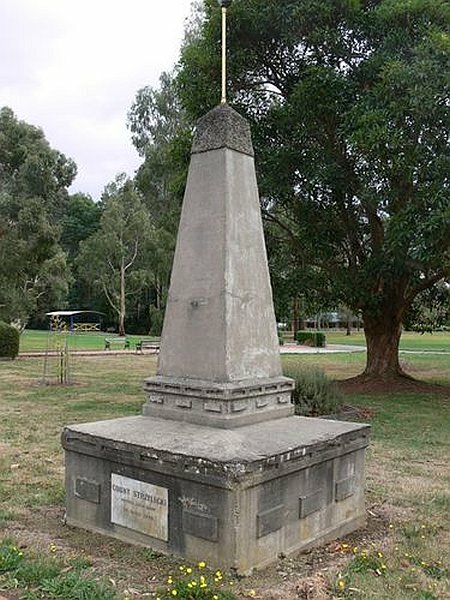 The Strzelecki Monument at Mirboo North is located on the north side of Ridgeway in Baromi Park, constructed by Tom Nilan in 1927. 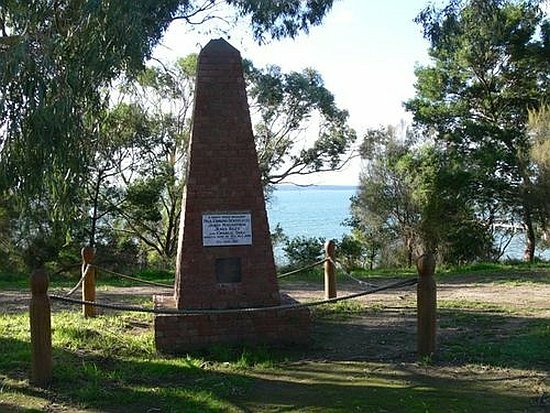 The commemorative plaque indicating the explorers passage through the area in April 1840, is in white marble with incised letters. 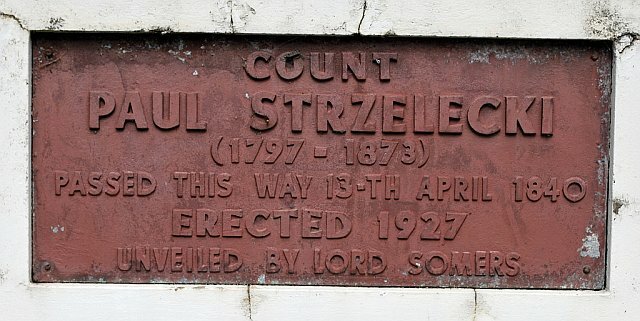 Was officially unveiled by the Governor, Lord Somers, on 8 April, 1927. 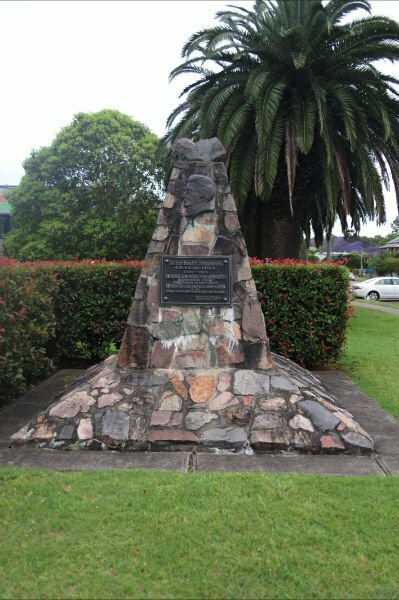 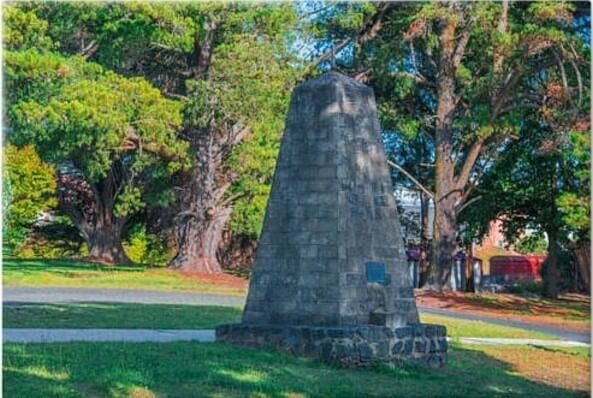 The Cairn was originally located at the intersection of Ridgway and the Strzelecki Highway (Thorpdale Road) opposite St Mary's Anglican Church and was relocated to its present site in February, 1972 as a result of road widening works. 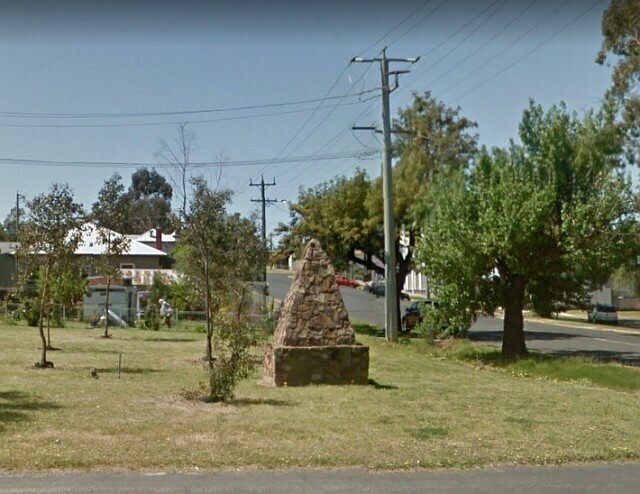 In 1994 a threat by Shire of Mirboo to have it demolished resulted in a public outcry, and it was saved following a public meeting. 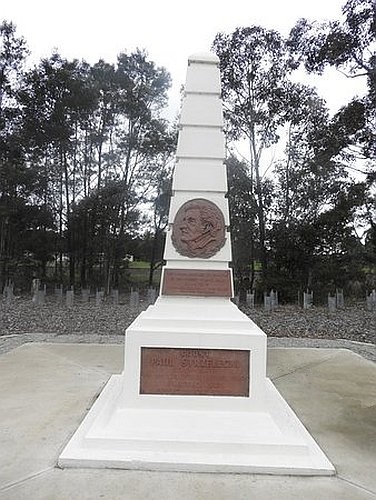 The Strzelecki Memorial at Leongatha was constructed by Jas. 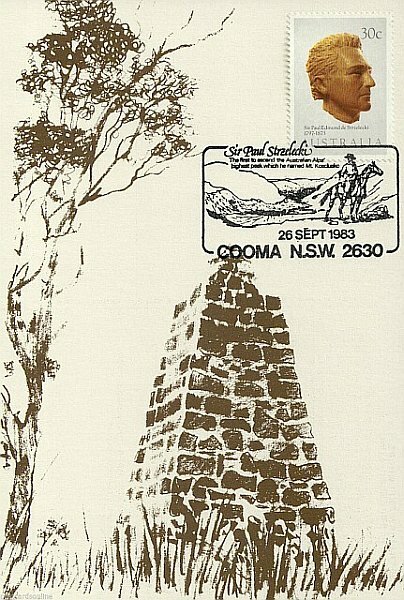 Palmer to the design of James T Knox. 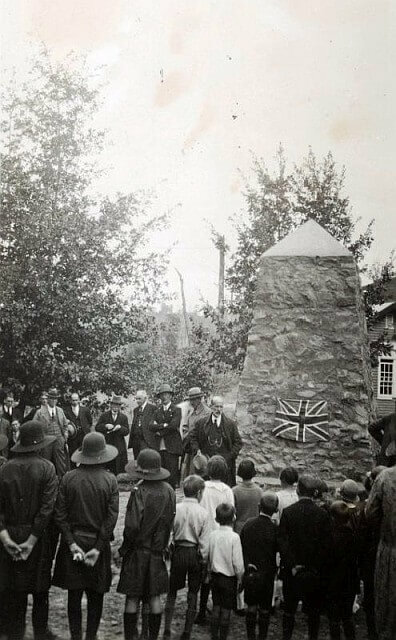 It was officially unveiled by the Governor, Lord Somers, on 8 April, 1927 in the presence of local schoolchildren and residents, and guests. 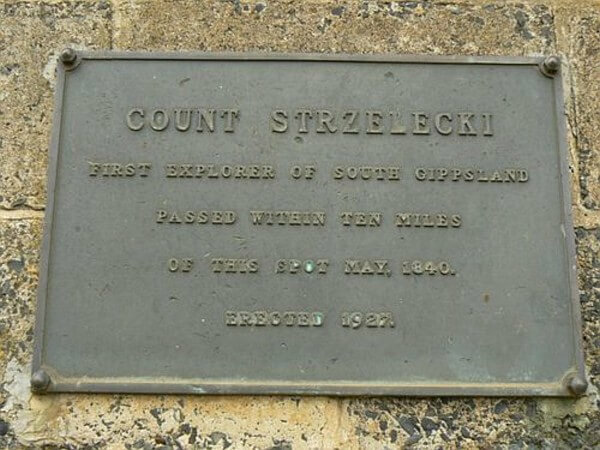 A bronze plaque on the east side commemorates Strzelecki’s passage through South Gippsland „Count Strzelecki. 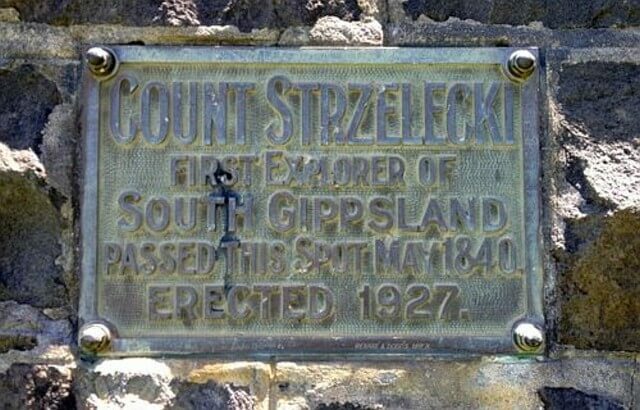 First Explorer of South Gippsland passed within 10 miles of this spot May 1840”. 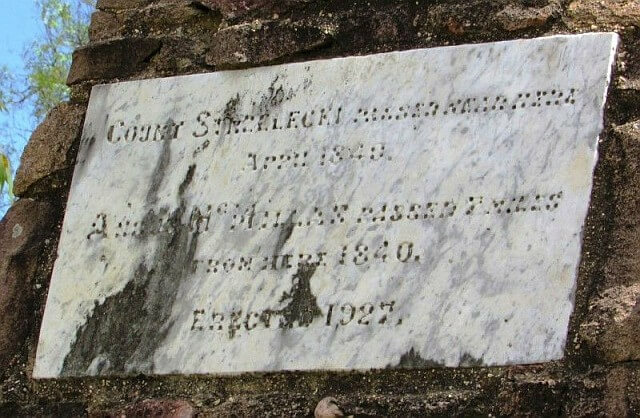 A drinking fountain is located above a small projecting trough below the plaque. 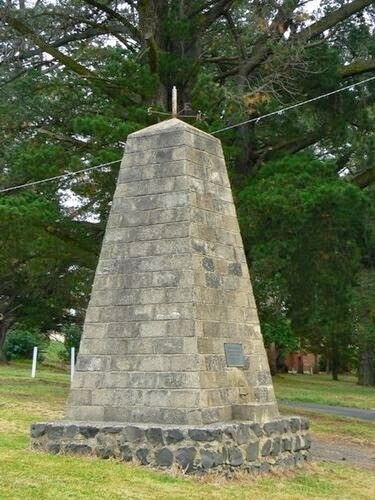 The Strzelecki Memorial at Korumburra, designed by the Korumburra Shire Engineer, Mr Horsfall and constructed in 1927 at Korumburra-Warragul Road, Korumburra. 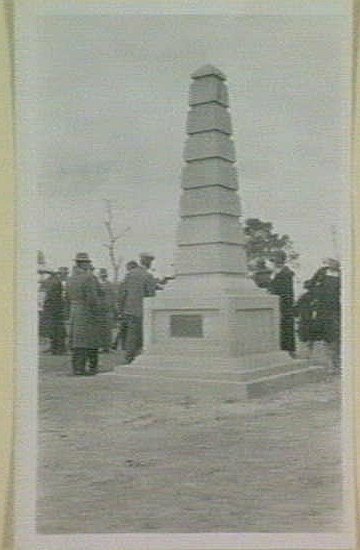 Was officially unveiled by the Governor, Lord Somers, on 9 April 1927. 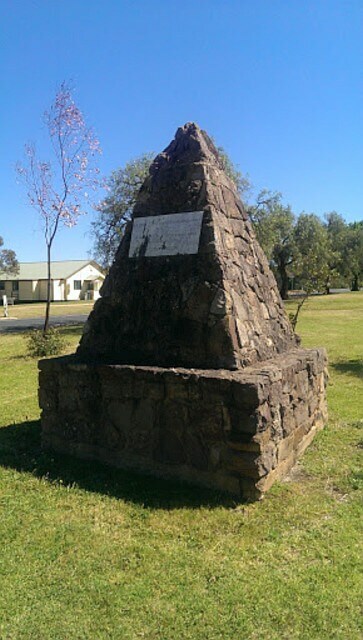 It is a simple roughly constructed tapered square column of split bluestone pitcher quoins and coursed bluestone rubble on a square base, with battered sides and a pyramidal top. 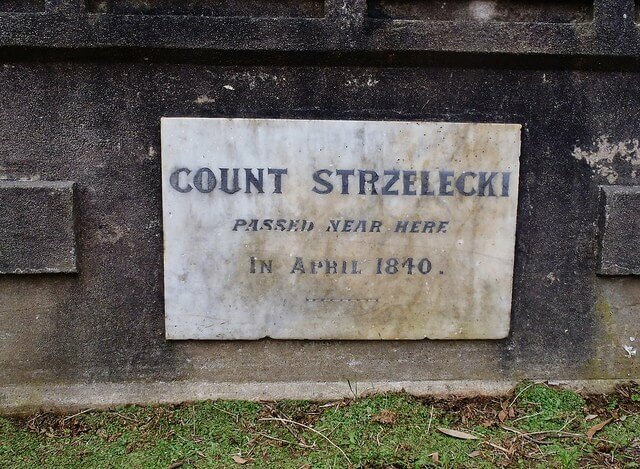 A bronze plaque on the east side commemorates Strzelecki’s passing near this place in May 1840 „Count Strzelecki, first explorer, South Gippsland passed this spot May 1840. 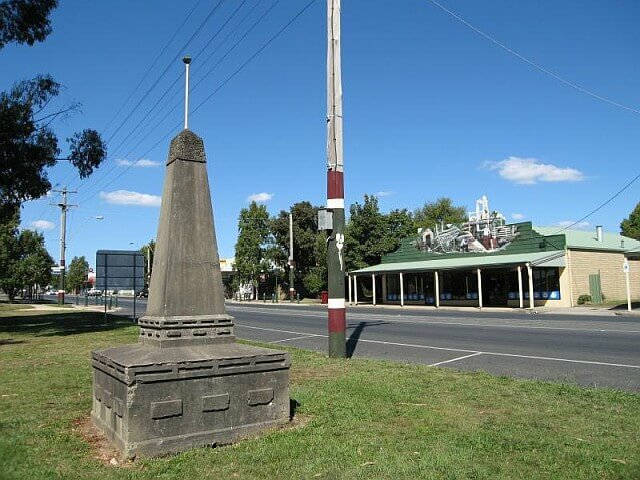 Erected 1927”. 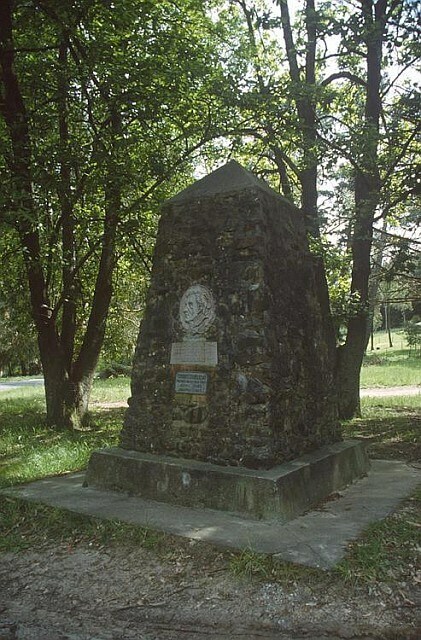 The cairn erected in 1927 commemorates Paul Edmund de Strzelecki who passed by this spot in 1840. 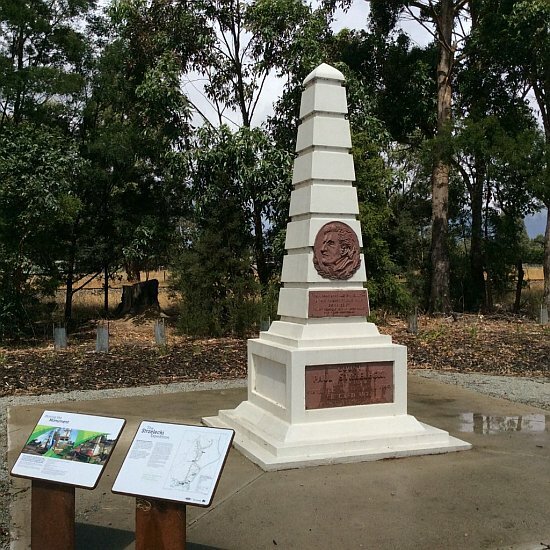 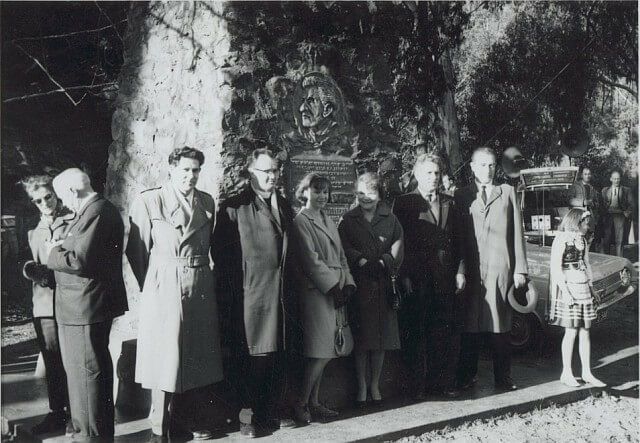 An additional plaque and relief portrait was donated by the Polish Association of the Latrobe Valley and unveiled in 1966. 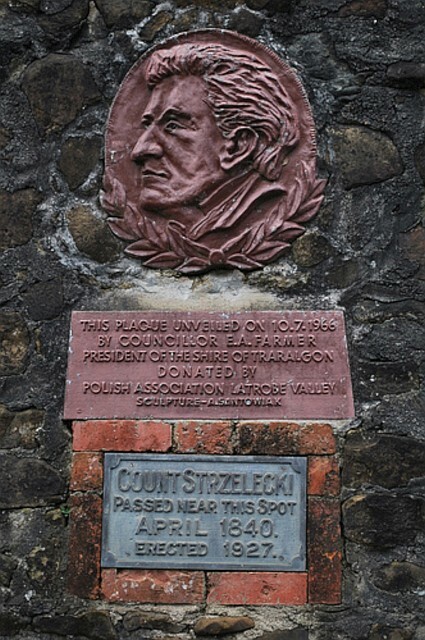 The relief portrait of Strzelecki was sculpted by A.Santowiak. 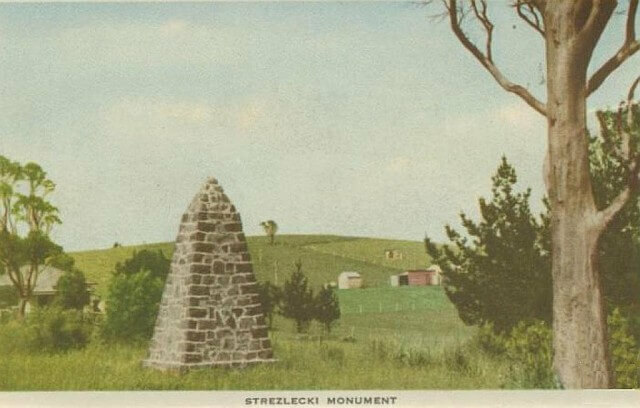 The cairn erected in 1927 commemorates Paul Edmund de Strzelecki who passed by this spot in 1840. 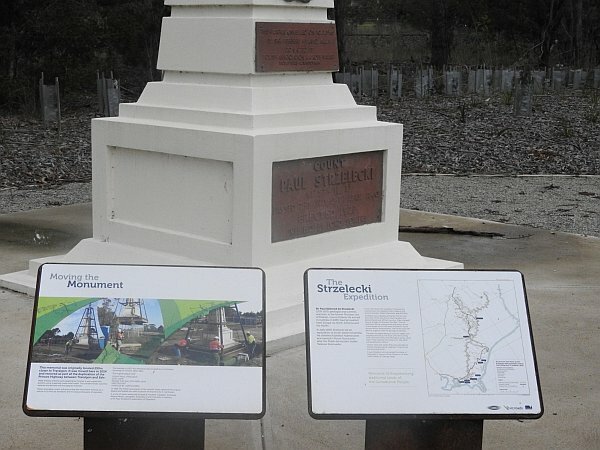 The Strzelecki monument in Traralgon had been previously restored in 1966 and unveiled by Sir Herbert Hyland on 10th July, with the addition of a new plaque and a relief portrait of Strzelecki that was sculpted by Arthur Santowiak and donated by the Polish Association of the Latrobe Valley. 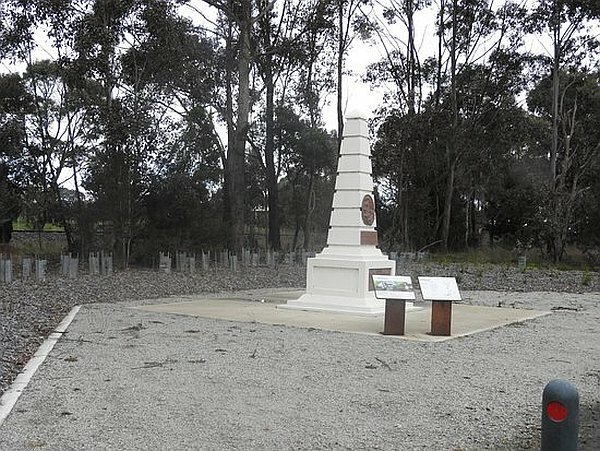 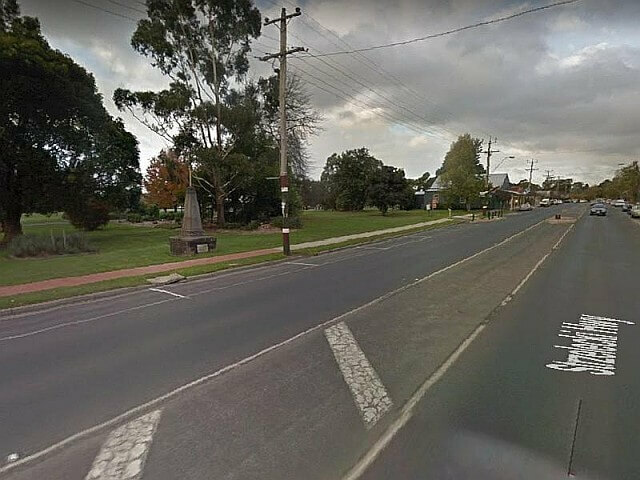 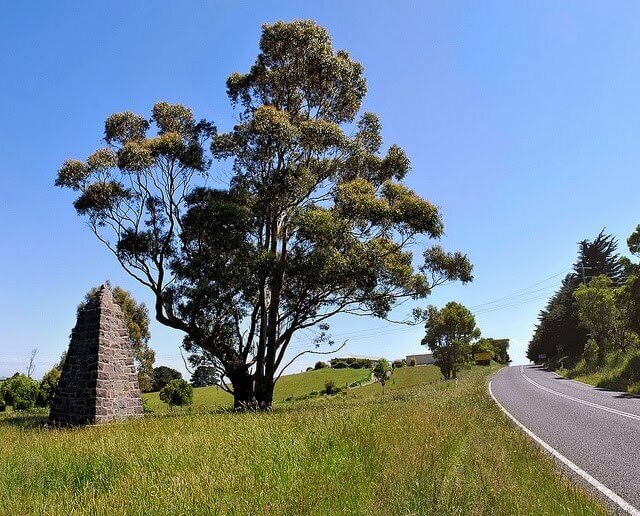 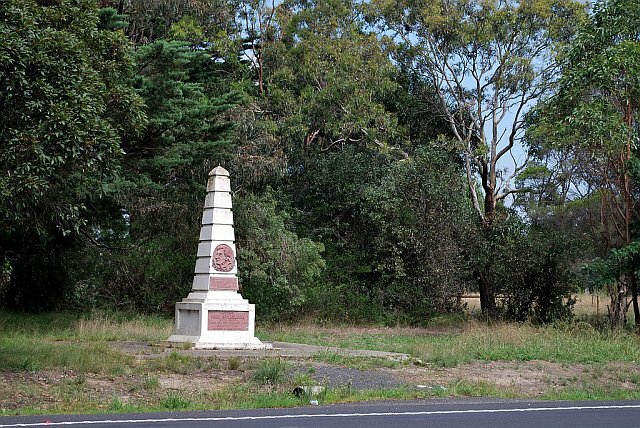 An historic monument acknowledging the path of one of Gippsland’s first explorers has been preserved for future generations as part of the duplication of the Princes Highway East. 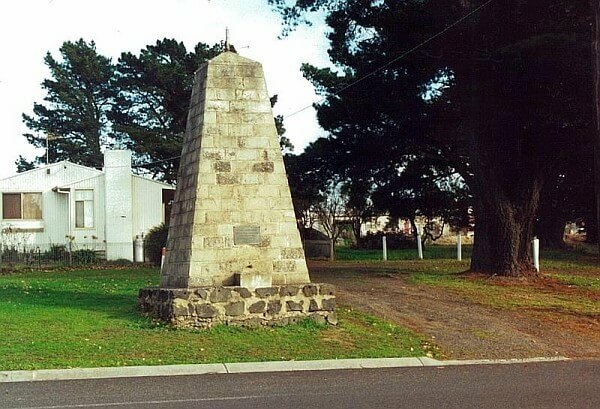 Corinella - Monument, at the end of Smythe St, commemorates Paul Edmund de Strzelecki who passed by Westernport in 1840 during his overland expedition from the Murrumbidgee River in New South Wales through Omeo and Gippsland to Melbourne. 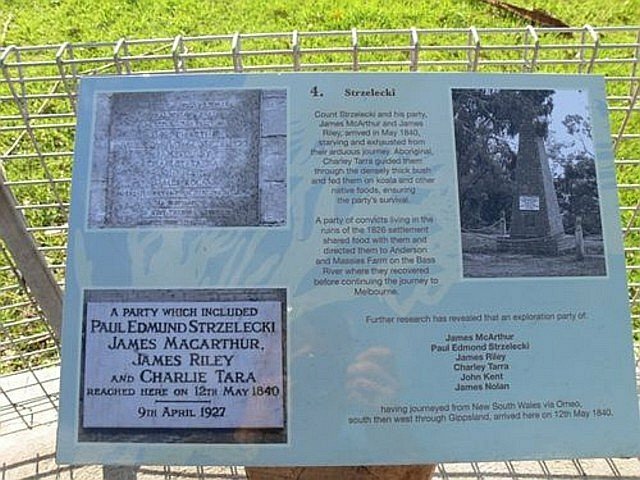 The inscription on the plaque was revised to include the name of their Aboriginal guide Charlie Tarra (spelt Tara on plaque) whose knowledge and hunting ability saved the party from starvation. 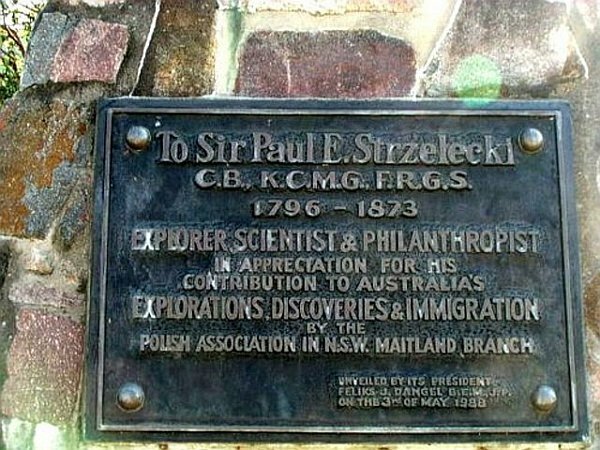 A monument commemorates Paul Edmund Strzelecki the explorer, scientist and philanthropist. 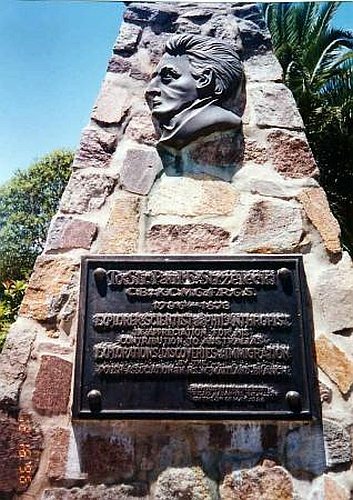 Erected by the Polish Community in appreciation of his contribution to Australia`s exploration, discoveries and immigration. 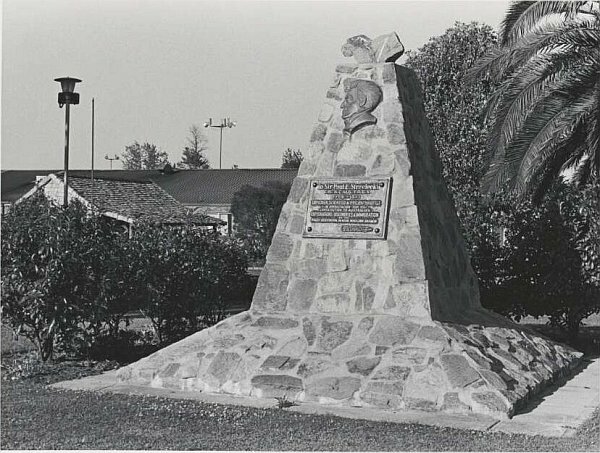 Unveiled by its President Feliks J. Dangel B.E.M. 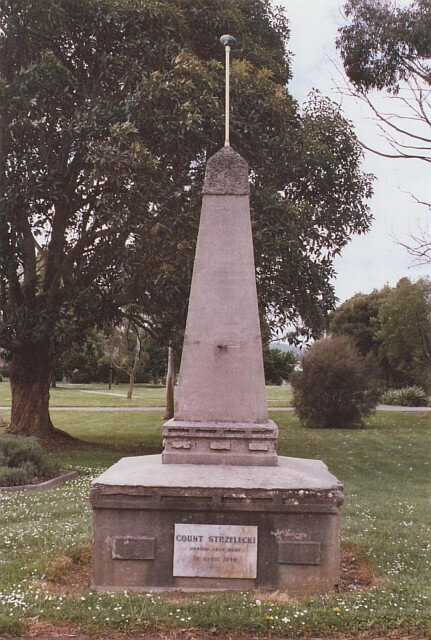 J.P. on the 3rd of May 1988.